An appeal was made to PSUs to contribute funds under their CSR Scheme towards Health Minister’s Cancer Patient Fund-CSR for treatment of poor cancer patients. India Infrastructure Finance Company Limited (IIFCL) has taken lead in the matter and contributed an amount of Rs.3.5 crore in 2015-16. 385 cancer patients have been benefited from the CSR contribution received from IIFCL during 2016-17. 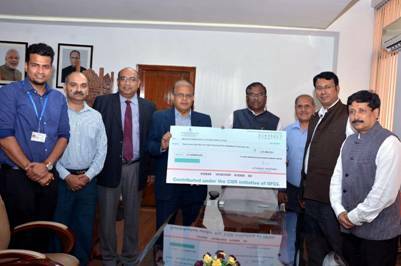 Cheque of Rs.3.50 crore was presented to Minister of State for Health & Family Welfare, ShriFaggan Singh Kulaste by ShriS.B.Nayar, CMD, IIFCL yesterday. ShriArun Kumar Jha, Economic Adviser, Health Ministry and Shri P.R. Jaishankar, Chief General Manager, IIFCL were also present.